The Warlords: Crystals of Power slot machine is an impressive offering from one of the online gambling industry’s best designers – Netent. There’s a lot to discover about this fantastic title, so let’s not waste time on pleasantries and get right to it! Great cinematic introduction. Really sets the mood of the game up well. Wonderfully stylised artwork and animations give the title a strong visual presence. Lots of different bonus features that make the slot stand out from other similar games. Possibly the most convoluted bonuses imaginable. Although they do add a lot to the replay value, some of the additions are rather pointless. “Wild” = 300x the line bet. Red warrior with wolf = 300x the line bet. Green warrior with panther = 200x the line bet. Blue warrior with wild boar = 150x the line bet. The levels and payouts means this game boasts a top payout of 1,000,000! During every spin of the main game, a Random Overlay “Wild” feature can be activated. The Random Overlay “Wild” features use a different reel set to the main game with no “scatters” on them. 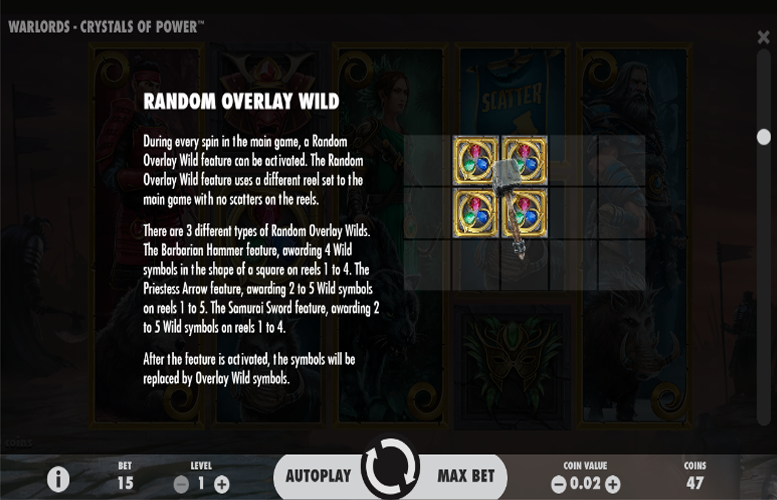 There are three different types of Random Overlay “Wilds”. The first is the Barbarian Hammer feature, which awards four “Wild” symbols in the shape of a square on reels one to four. The second is the Priestess Arrow feature, which awards two to five “Wild” symbols on reels one to five. Finally, is the Samurai Sword feature, which awards two to five “Wild” symbols on reels one to four. After the feature is activated, the symbols will be replaced by Overlay “Wild” symbols. The game features three different “Scatter” symbols with each one having a Free Spins game associated with it. 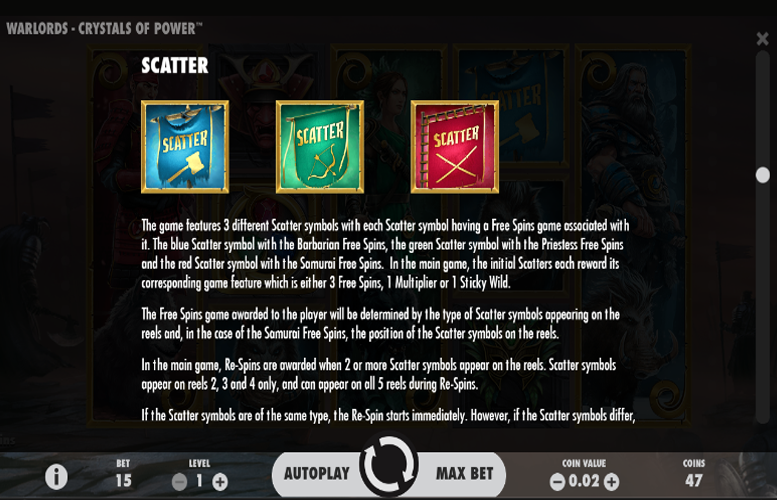 The blue “Scatter” symbol activates the Barbarian Free Spins. The green “Scatter” symbol activates the Priestess Free Spins. Finally, the red“Scatter” symbol activates the Samurai Free Spins. During the main game, the initial “Scatters” each award its corresponding game feature which is three free spins, one multiplier, or one Sticky “Wild”. The Free Spins game awarded to the player will be determined by the type of “Scatter” symbols appearing on the reels and, in the case of the Samurai Free Spins, the position of the “Scatter” symbols on the reels. During the main game, Re-Spins are awarded when two or more “Scatter” symbols appear on the reels. “Scatter” symbols appear on reels two, three, and four only. They can only appear on all five reels during Re-Spins. If the Scatter symbols are of the same type, the Re-Spin starts immediately. However, if the “Scatter” symbols differ, they randomly transform so that all “Scatter” symbols are of the same type before the Re-Spin begins. If two different “Scatter” symbols appear on the reels, one “scatter” is randomly chosen after a battle to turn into the other symbol so that they are both the same before the Re-Spins begin. There is a 50% chance that either symbol will be chosen. If two “Scatter” symbols of the same type appear on the reels with one “Scatter” symbol of a different type, the “Scatter” symbols will, after a battle, transform into the same type before the Re-Spins start. In this situation, there is a 75% chance that the symbol of which there are two will be the active symbol. If three different “Scatter” symbols appear on the reels, the “Scatter” symbols will, after a battle, transform into the same type before the Re-Spins start. In this situation, there is an equal chance that each symbol will become the active one. During the Re-Spins, the active “Scatters” will stay in their position with all other symbols being inactive. There are no additional betline wins during Re-Spins. Additional Re-Spins can be activated after the initial Re-Spin if a new “Scatter” symbol appears of the same type as the one that is already active. Re-Spins also use a different set of reels to the base games. Three or more “Scatter” symbols will activate Free Spins. If Free Spins are not activated after Re-Spins, the player has one final chance to activate them. If the Re-Spin mode does not land an additional “Scatter” on the reels, the Final Chance feature is awarded. In this mode, either a coin win or a “Scatter” symbol will be revealed. If a “Scatter” symbol is revealed by the feature, the new “Scatter” will be randomly placed on the reels containing no other “Scatters” and the Free Spins will begin. If the Re-Spins are triggered with two “scatters” and no additional “Scatters” appear during the Re-spins, the player will receive a random feature that will reveal either a coin win ranging from three to 100 times the bet, or a “Scatter” symbol at a random position on the reels. If the feature reveals a “Scatter” symbol, it will be randomly placed on the reels and the Free Spins will begin, meaning no additional Re-Spins are awarded. When no more Re-Spins are activated, if there are three or more of the same type of active “Scatter” symbols on the reels, the Free Spins mode will begin. 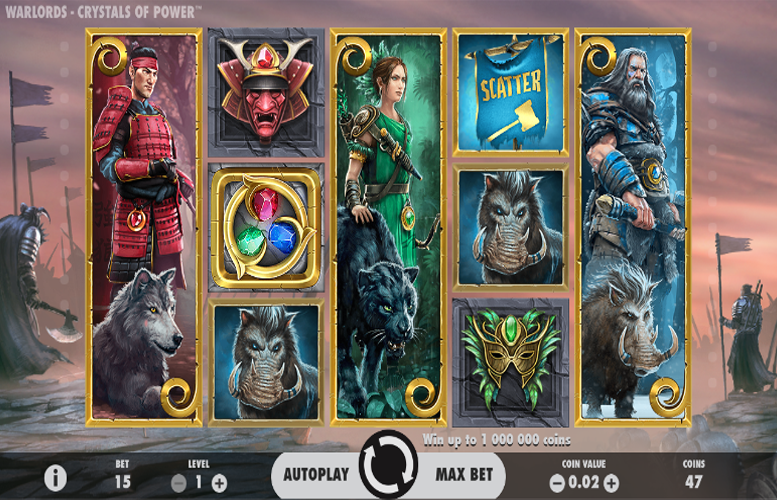 Barbarian = Blue “Scatter” – awards nine free spins. Only the warrior and animal symbols are present, and each new “Scatter” will add three extra spins. Priestess = Green “Scatter” – awards seven free spins. Each additional “Scatter” will add an additional +1 to the multiplier. Samurai = Red “Scatter” – awards five free spins. The “Scatter” symbol becomes a Sticky “Wild” for the duration of the Free Spins. Wolf = 120x the line bet. Panther = 90x the line bet. Wild boar = 75x the line bet. Red mask = 60x the line bet. Green mask = 50x the line bet. Blue mask = 40x the line bet. 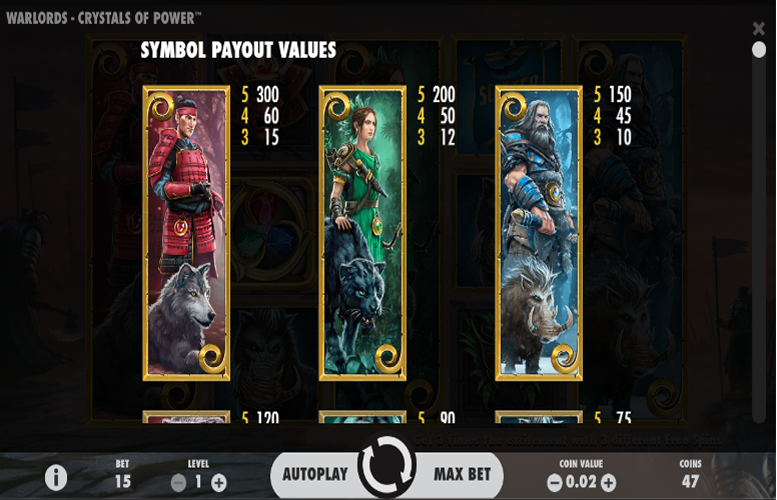 In the Warlords: Crystals of Power slot, players can only adjust the number of coins bet on each of the 15 fixed win lines (between one and ten), and the value of each of the coins (between 1p and £1). This means that the maximum and minimum betting limits are 15p and £150 respectively. 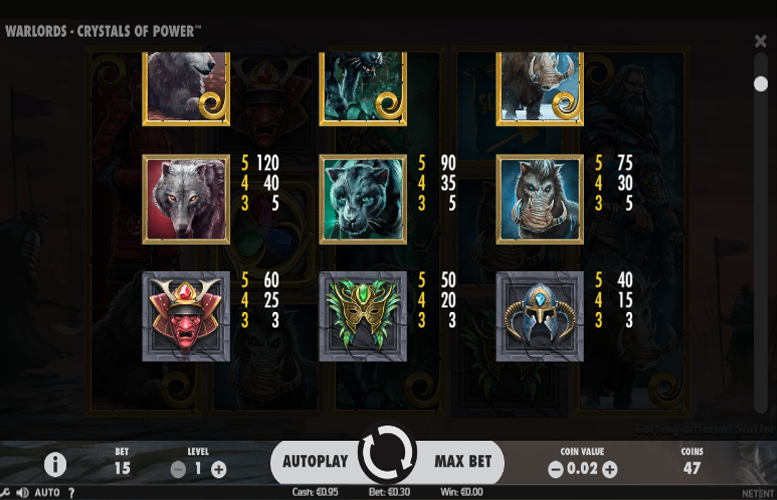 The Warlords: Crystals of Power slot machine is without doubt one of the most visually impressive slot machines we’ve ever played. Each symbol is beautifully illustrated and there are loads of great animative touches to boot. To top it all, there are multiple great bonus features too. The one thing stopping us giving this one a perfect score was how confusing the rather convoluted bonus features are. It took us actually experiencingthem once or twice to get our heads round them all! This game has a rating of 5 / 5 with 817 total reviews by the users.